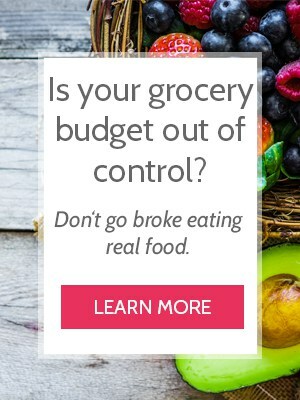 I’ve written a lot of meal plans over the years… there’s the Whole30 meal plan, the $50 ALDI meal plan, the original $50 one week meal plan, the second $50 one week meal plan… not to mention the THREE YEARS worth of MONTHLY meal plans too. I can’t please everyone, but I would like to fulfill some of your requests, starting with a whole week’s worth of vegetarian dinner ideas! No matter your reason for wanting vegetarian dinners, we’ve got you covered. There’s lots of flavor, no meat and it’s super friendly on the budget too! 100% real food vegetarian recipes that are simple, straight-forward and family friendly. Easy recipes that can be typically be made in under an hour. A few store-bought items for foods I usually make from scratch (breads and vegetable broth). Feel free to make these items from scratch if you prefer. 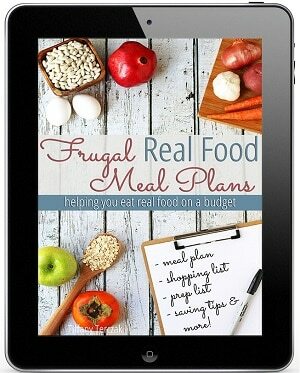 This plan is not tied to a specific grocery store or price point, but I’ve ensured it’s frugal and budget-friendly. To save the most money, shop from your own kitchen first, substitute whenever possible, and shop your local sales for the best deal. Spices, oils and vinegar. This plan doesn’t use large amounts of these things, and you likely already have these cooking staples. Honey or brown sugar. These are both used in a baking recipe this week but the amount called for is small and common substitutes are available for both. Precautions for food allergies. My family is blessed to not have food allergies (that we know of!) and since my blog is a real food blog, not necessarily an allergy recipe blog, I don’t account for food allergies in my meal plans. 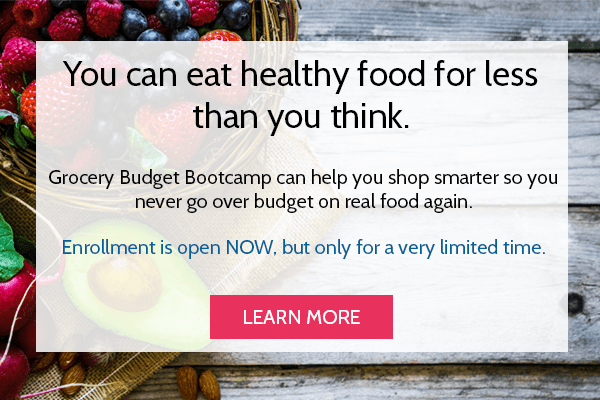 This meal plan also doesn’t include breakfast or lunch recipes because in my experience, the majority of families have personal preferences on what they want for breakfast or lunch. 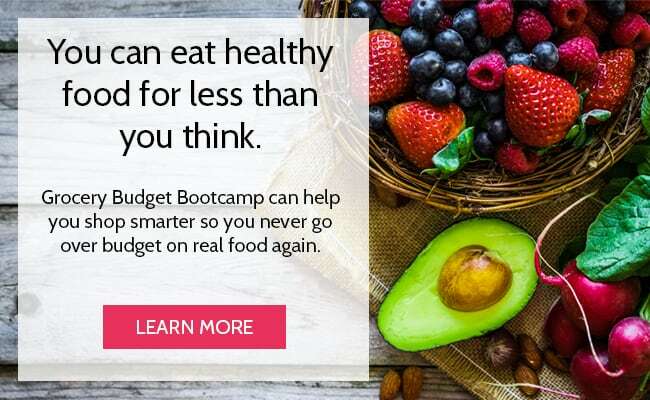 No worries though – I have NO DOUBT the ingredients you buy for this meal plan will provide extras that you can use to cover breakfasts and/or lunches. Use the “Bonus Meal Ideas’ section at the bottom to create your own breakfast and lunch menu. Those are just some ideas to get your started, but they’re there to help you use the ingredients you’re already buying! 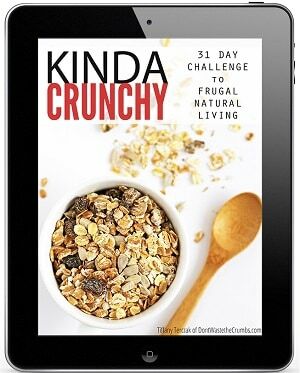 Click HERE to download the One Week Vegetarian Meal Plan with recipes and shopping list. The goal with any plan is to buy as little food as possible, use everything you buy, and to do both without sacrificing taste or quality. Mmmm… butter. You’ll be using this for Alfredo and delicious Masa Corn Bread. We’re using cheddar cheese primarily for Tomato and Spinach Grilled Cheese, but I recommend buying an 8 ounce block and using it on the Loaded Baked Potatoes. You are only going to need 3 eggs for this plan so you will have several leftover so, use one of the “Bonus Meal Plan Ideas” to use them up. Typically half-dozen eggs aren’t any cheaper than the full dozen, but be on the lookout for store markdowns! You only need 10oz of yogurt for this meal plan but most small cups are portioned into 6oz containers. You can either buy a larger container of Greek yogurt and put the leftover to good use with one of the “Bonus Meal Plan Ideas,” or buy two smaller containers and enjoying those last couple ounces to a breakfast or snack. Be sure to check prices so you’re getting the best bang for your buck. Heavy cream is the star in the Alfredo! 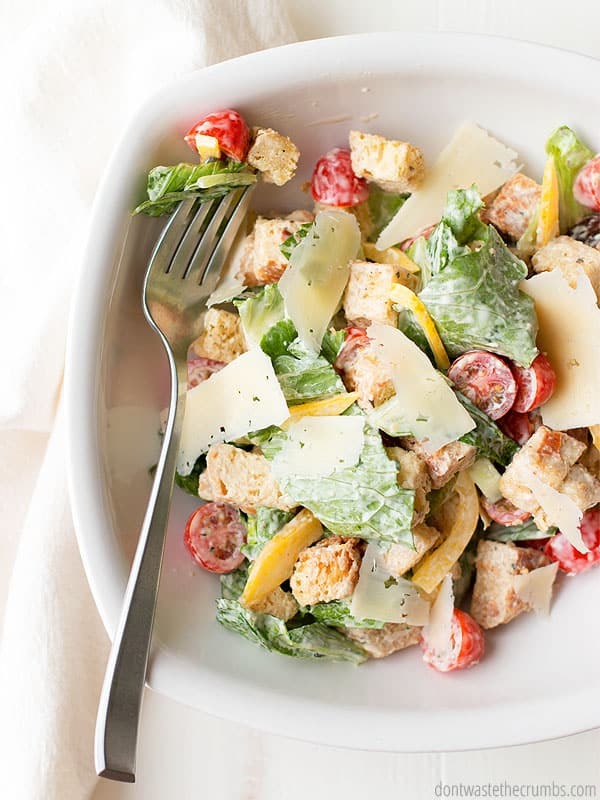 Along with heavy cream, fresh parmesan makes Alfredo as delicious as it is. If you have any leftover, use it on top of your Tomato Basil Soup. 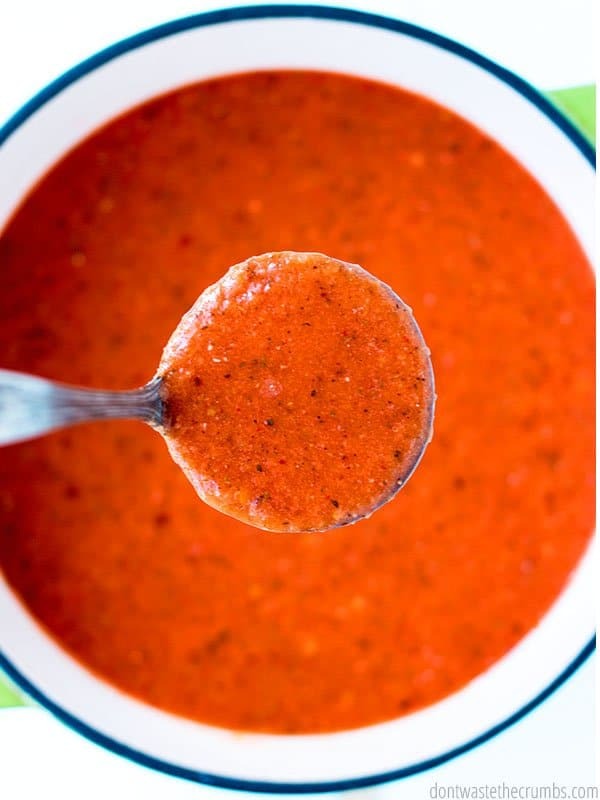 Milk is needed for Masa Corn Bread, and since you’ll have extra, we’re adding a splash or two to the Tomato Basil Soup to make it light and creamy. Cranberries are my absolute favorite in the Winter Waldorf Salad, but they’re not super cheap. If you can’t afford cranberries, or can’t find them, using raisins would work. Typically used to make corn tortillas, we’re instead using masa harina flour in Sweet Potato Taco Soup and Masa Corn Bread. The masa adds the flavor of tortillas chips to the soup without the added cost or preservatives that come with processed chips. On top of the awesome flavor in the soup this flour also makes a killer corn bread! I also usually make my own vegetable broth as well, but I’ve included it in the “pantry” list in case you don’t have vegetable scraps I the freezer. You’re going to use it in Tomato Basil Soup and Sweet Potato Taco Soup. 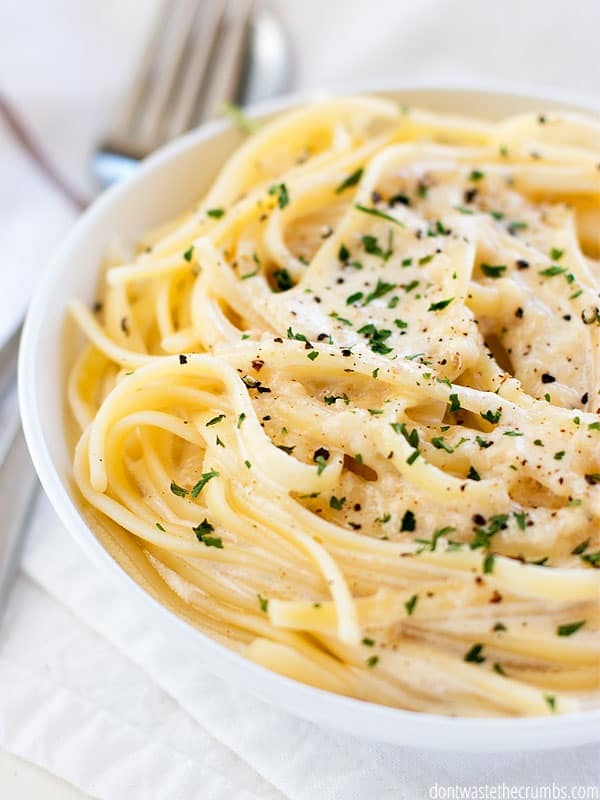 Fettuccini Alfredo isn’t quite the same without fettuccine, but feel free to substitute if you have another pasta already at home! I love sunflower seeds for the crunch it adds to salads, but if money is tight, you can omit these. Another great option though, is chopped nuts – any nuts will do! As with most recipes calling for tomato paste, there will be some leftover here. Here’s how you can freeze tomato paste for later and not waste the rest of that can! Simple and straight-forward, we’re using this in Sweet Potato Taco Soup. These tomatoes are for the Tomato Basil Soup. I prefer Cento Tomatoes, but any brand that doesn’t have additives will work. We’re using whole wheat flour for Black Bean Burgers and Masa Corn Bread. If you don’t have whole wheat at home, I recommend substituting for all-purpose to keep costs down. There’s lots of delicious garlic this week! We’re using cilantro in the Warm Black Bean Salad and Black Bean Burgers. Any leftover cilantro would be great as a topping for the Sweet Potato Taco Soup! This meal plan will split this apple between the Winter Waldorf Salad and Spinach and Kale Side Salad for the week. Cabbage brings crunch and cheap nutrition as slaw for the Black Bean Burgers and Warm Black Bean Salad. These will be used in the Warm Black Bean Salad and as toppings throughout the meal plan, so if they’re on sale, feel free to buy 2 bunches. Keep the white ends and re-grow them in water to have even more green onions later! Add some heat to the Warm Black Bean Salad with jalapeno. Go small and smooth if you like it mild, or choose a bigger pepper with more wrinkles if you like it hot! A bunch of kale is so much cheaper than a pre-chopped bag of kale, and you’re using it in two hearty salads this week. You can either buy a fresh lime or use lime juice, if that’s what you already have at home. 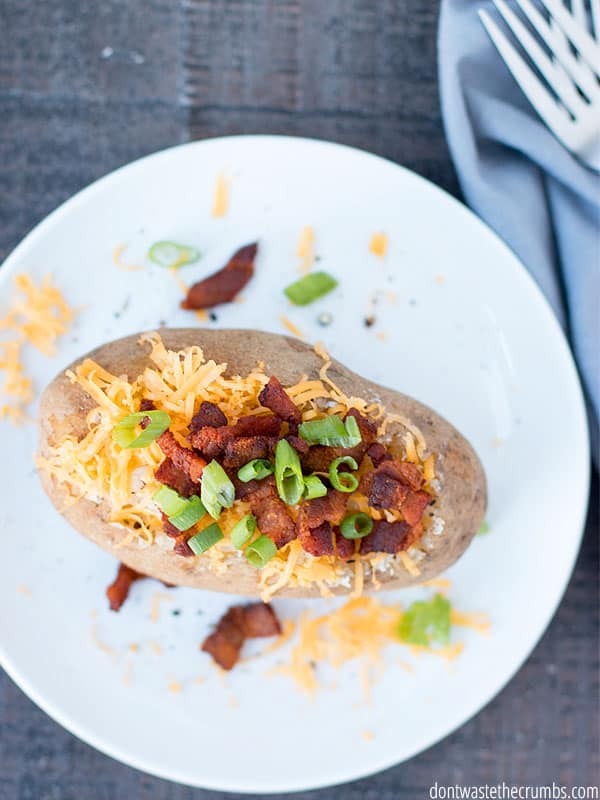 We’re included mushrooms in the Loaded Baked Potatoes, but you can use whatever variety of mushrooms that are on sale. Since onions are so versatile and called for in just about everything, buying a 2lb to 3lb bag would be a great money saver in the long run as bagged produce can run cheaper than per pound in some cases. The Warm Black Bean Salad calls for red bell peppers, plus you’ll roast some off to top your Black Bean Burgers! One of my favorite vegetables to cook with because they are so cheap! We will be using potatoes in both Potato Wedges and Loaded Baked Potatoes this week. Be sure to compare prices between pre-washed spinach and a bunch of spinach in the produce section. Depending on the time of year, bunches can be really affordable! These are the star of the Sweet Potato Taco Soup. While adding sweet potatoes to taco soup may sound odd to some, it is definitely worth the risk because it is so darn tasty! Even though these aren’t in season yet, I love using them in the Grilled Cheese with some spinach to create a yummy twist on a classic. For this meal plan you will need two pounds of frozen corn kernels. 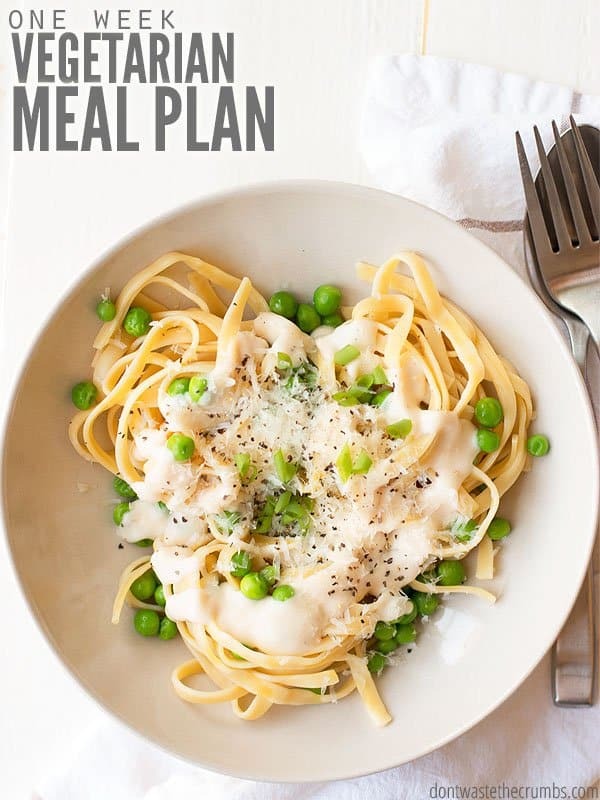 Frozen peas are adding a little flare to your Alfredo this week. Also remember that you will have a few extras leftover of certain things you buy, so use the “Bonus Meal Ideas” to use them up so they don’t go bad! As you can see from the items above, you’ll have a few leftover ingredients from your shopping trip. 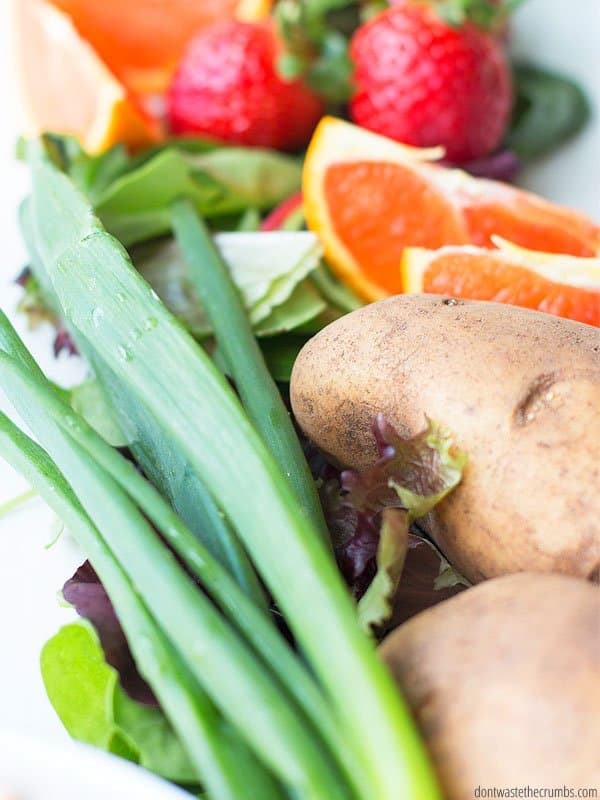 Here are some bonus meal ideas to use it all up, so nothing goes to waste! How do you keep costs down while eating a vegetarian menu? I’d love to hear your ideas! Please leave them in the comments below! Thanks for these ideas! I’ve missed your meal plan posts. Are there links to the recipes? I just updated the post Kristen! These all sound amazing! I’m so excited to try. I don’t see a link for recipes? I just updated the post Cassie! Are there links to the 7 dinners and bonus meal ideas? I see the text but no links or recipes. Excited to check them out! 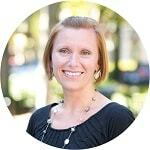 I just updated the post Rachel! Thank you! Is it just me, or are the hyperlinks for the recipes not working? Thanks! Not you – there are no links. 🙂 I just updated the post with a download option! Hi Tiffany. Thank you for your wonderful blog. This year we decided that we would begin to incorporate (3) meatless meals per week in my weekly meal planning and I am always looking for new recipes. I am wondering if there is a link to your one week vegetarian meal plan recipes? I just updated the post Roxy! This looks wonderful! Is there a way to get the recipes? Yes! I’m working on that right now! I just updated the post Ashley! Yay! Thank you so much! I know these meal plans are a lot of work to put crest and put together. And it’s awesome that you provide them free! On behalf of my family we truly appreciate your site! Hi Toffany, I was browsing around to find new veggie meal ideas and I found your website. I read this article and, of course, entered my email to get the deal. I’ve been impressed by your attention to recipe details and images. I’ve read your story and I can say it inspired me a lot. Last but not least you have 2 wonderful children (I’m mom too). Enter your information below to have the One Week Vegetarian Meal Plan (including recipes and shopping list) delivered straight to your inbox!